I wanted to make a big, fancy two layer yellow cake today, but reality set in and I realized I wouldn’t have time to go buy cake flour and frosting ingredients. Luckily, I did have a hodgepodge of coconut, oats, wheat germ and was able to make a quick batch of what may be my new favorite coconut chocolate chip granola bars. 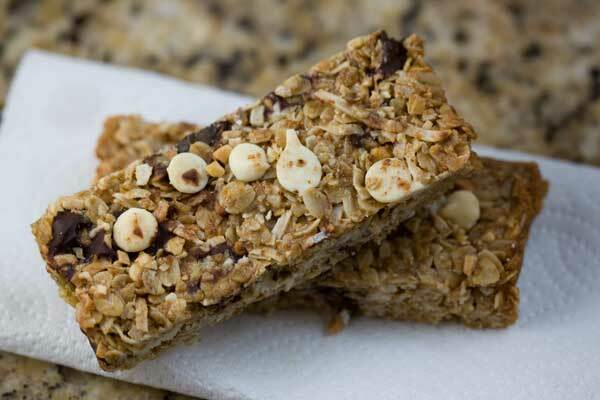 Chewy Coconut Chocolate Chip Granola Bars are made by toasting the oats, coconut and wheat germ lightly, then blending them with butter, peanut butter, brown sugar and honey. Because the mixture is quite hot, it is cooled slightly before the chocolate chips are added. Line a 9 inch square metal baking pan with nonstick foil or parchment paper. Spread oats evenly on a large rimmed parchment-lined baking sheet and bake at 350 for 5 minutes. Add the coconut and wheat germ to the baking sheet and continue toasting for another 5 to 8 minutes, stirring every so often, until the coconut starts to brown. Remove from oven and let cool. Pour into the lined square pan and press tightly into the pan. Bake for about 15 minutes. Let cool for about 30 minutes, then lift from the pan and score (do not cut) into bars. Put the scored bars in the refrigerator until firm, then carefully break them apart along the scored edges. Chilling the bars will help them hold together when sliced. You can the bars into square or make 8 long bars and trim the edges. If you only have old fashioned oats, you can use them as is or buzz them for a few seconds in a food processor. Quick oats are cut smaller than old fashioned and will give you a different texture, but old fashioned oats -- especially when chopped up a little (not completely ground) work just fine. I don’t usually have wheat germ on hand but use ground flax and/or chia seeds with great success. These look like great bars. I will be trying soon. Christine, thanks for pinning and sharing!! The wheat germ adds a really nice flavor and probably helps hold the bars together since it forms a matrix with the liquid ingredients. However, I think you could just leave it out and the bars would still be great. Good luck! These would be perfect for a lunch box treat! Pinned and shared! Rynda, sorry! It’s flaked “coconut” not flaked granola. I love homemade granola bars- these look good!